What Finnishness mean to me? The principal thing that Finnishness means to me is freedom. I´m free to decide the basics of my life such as where I live, work or what is my education. Of course, especially the last two I mentioned require hard work but for example education is almost free for everyone. I also mean human rights issued when I speak about freedom. To my mind in Finland there is freedom of expression and speech. In my experience, we can express ourselves freely when we talk about social and private matters. We also have some legally guaranteed freedom which are prohibited by law in many other countries. For example, to decide our sexual orientation, religious liberty and the right to abortion. Finland is famous for its pure nature and wilderness areas. I can say that I´m always close to nature because we have several nature reserves. When I want to go in a natural place it takes only about 15 minutes by walk even though I live in the centre of the third largest city in Finland. If I use a car, I can discover an awesome hiking areas just about an hour drive away. All over Finland are located dozens of national parks so it is possible for Finns to visit these wonderful places regardless of where you live. Even though most of the national parks are government area, many cities and municipalities have invested specific nature areas where people can visit to relax. Sweating and purity. When Finnish is in the sauna it is a time to relax, or have social interaction as well. For me, it is both depending on the situation. When I´m home at the sauna I don’t spend lot of time there, it´s usually a short relaxation time. But when we go to public sauna whit my friends it´s time to convers and socialized. Finns are famous about poor small talk skills but in the public sauna they change that behaviour. In my opinion, one of the best things a Finnish winter is the hole in frozen lake and sauna. Christmas means to me time with family, good food and chocolate, specific TV-programs e.g. Santa´s Hot Line and Snowman and of course, giving and having Christmas presents. When I was a child I enjoy both the real Christmas tree which we had with my dad, and my mum home cooked food and bakery. These habits I try to keep in my own-made Christmas. Every Christmas I also lose my mind because of flowers, so my home is like a flower shop all Holidays. As an art student, the first thing I want to mention about Finland is Tove Jansson and the Moomin comics that she created. Though the Moomins got their start in the 30’s as a mere scribble on the outhouse wall they have become an international prestige. After more than 80 years, Moomins are still going strong. Comicbooks have turned into TV-shows, museums, dishes, fabrics… you name it. Story, originally writen about lonelines, alcoholism and depression has turned into something sweet and comforting, a good childhood memory. Some how I see this as a very Finnish thing, even if there is a cold and dark winter, there is also going to be spring, summer and a beautiful fall. So there is always something to wake up to after a long winter! And that leads us to the four seasons. In Finland, the year is devided between four distinct seasons – autumn, winter, spring and summer. Unlike in many other parts of the world, in Nordic countries it can be +30°C during the summers and during the winters the temperature can go as low as -40°C. During the winters the sun barely gets up, but then in the summer it barely sets. After the long winter of snow, ice and darknes the sun appears again. Snow and ice melt away, birds get back from the south and summer is ready to start in a couple of months. Summers are bright and hot, though there can be some rain. During the summer most students have their summer vacation and cities and countrysides are full of life again. After summer, it’s time for autumn. Little by little the weather gets colder and days shorter. Leaves will start to show their autumn colors “ruska” in finnish. In a couple of months its time for snow again. Salmiakki translates to salty liquorice. It’s a traditional Nordic candy. Its both salty and sweet at the same time and it’s made out of ammonium chloride. It’s not certain, when salmiakki was created, but it’s said to be originated from a cough medicine that was made in pharmacies. In the 30’s it was already produced in the Nordic countries as a candy. Most of the Finns enjoy the taste of salty liquorice, but there are some exceptions of course as always… not me though…! What to means to be Finnish? -That means to me a lot and I tell you why. My personal favorite thing is to be Finnish is winter, sauna, peaceful and pure nature and “the sisu”. Winter is my favorite time of year. Especially late winter when day is longer than autumn winter and sun is shining. Then is great to be do outside activities like ice skating, ice fishing and my one of favorite things snowboarding. In Finland we have lot of ski resorts and Finland has one of best national team for snowboarding. I live of my youngling time in countryside so when I was young I spent time to playing the near forest. I also was fishing a lot. Nature are pure you can go to collect berries and mushrooms. In Finland we have also every-mans-right what means you can hiking and camping forest regardless who they own. That it is awesome. We are nation who loves to peace and personal space. We don’t speak lot of small talk and it is awkward speak with strangers. But we made exception one place: Sauna is only place where Finns don’t have personal space and we also are naked and maybe talks small talk, and that is kind of funny when I realize that writing this blog post and that is some kind of funny. It is great to be Finnish. The task to “give someone an understanding and a vision of what the concept Finnishness means” is confusing. This is solely just because I don’t know what that is myself. Not even a little bit. Maybe cultural history, common habits and clichés are not what construct “Finnishness”. If something like that even exists, could it be subjective to everyone, not a concept you can show or explain to someone? In that case, what constructs my Finnishness? I don’t know really. But one can always try to find out. Well, at the beginning of my epic quest I found myself thinking more about the term “national identity” and how that too is weird to me. (Why must everything confuse me?) A web dictionary I found (www.dictionary.com) defines “national” as follows: “peculiar or common to the whole people of a country”, whereas “identity” is “the condition of being oneself or itself, and not another”. Isn’t there a conflict there somewhere? However, the idea here is probably recognizing things that represent us Finns as a cohesive whole and I think I can come up with few things. So to put all that silly thinking aside, there are a lot of saunas in Finland, which people like I guess, because they keep making and using them. If someone hasn’t ever done the whole “Let’s go to a cabin and go to the sauna and roll in the snow and then repeat” – experience, I think they should. It really is great. Also you have a good chance of seeing naked butts (which is just a fact no judging or perverting). If I had to say something about Finnish values I might comment on the fact that some people here have them, which is kind of nice. People tend to appreciate nature and the fact that people are treated equally. Here it would be really weird if you talked differently to a professor or to a university maintenance worker. Peeps like it equal here. I don’t follow sports that much, but Finnish teams are sometimes ok in hockey and people get really excited about it when they are. Also if I had to, I could only name maybe like five traditional foods we have. So I guess that says something about that. Anyways to conclude, I really do understand that Finland has culture that is unique to it and has many lovely aspects that we should be proud of and maintain as valuable “property”. Some of these things are in our daily lives and they really do have influence on us. For example, our country’s history (obviously) continues to affect people today (like the Finnish Civil War) and in many ways things like that too can be seen as cultural identity, as it is culture and specific to people here in Finland. “If private schools are considered better, then why does the free education system works so well in Finland?” I saw this written in the internet once and started wondering the same as well. Finnish do take free education and monthly student support for granted but I have learnt to appreciate it since I have traveled to other countries. System works because as a student you really have to earn your place in the University. The school gets money from the government as the student has reached annually demanded credits and when the students graduates. In Finland there is 0% of corruption. If there is, the whole country will certainly hear about it. We are serious in that way. Finns do seem a bit serious at times but as workers they are very valued for having that feature. I think Finns are like the seasons in Finland, they are a bit more extreme than in other countries. Let me explain: Finns work hard and produce good quality. When Finns party they consume much more alcohol than others. Even if you are a Finn that doesn’t think they drink a lot, you probably still drink more than your foreign friends. See my point of taking everything seriously? Finns take their humor seriously too. Believe it or not, Finns laugh a lot and comedians have come even more popular in Finland than before. Even though many people in this county says that Finns are introverts, I have to say that this is not so true. 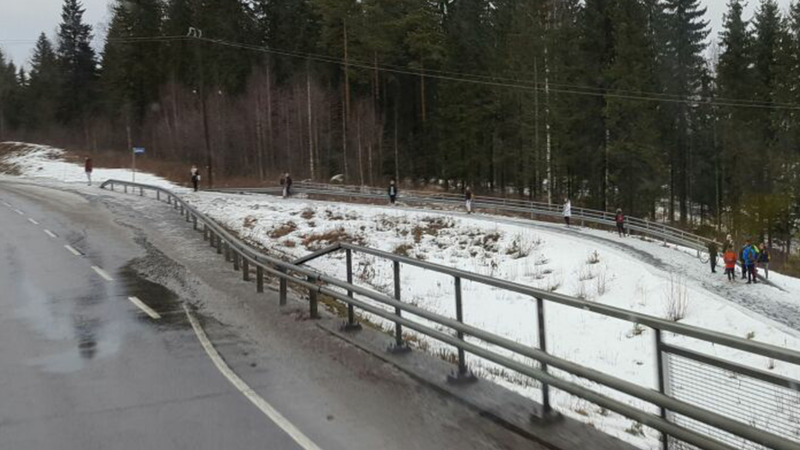 Finns like to travel around the world and these days people have many foreign friends. One Irishman who had lived in Finland for nine years said that Finns are like coconuts. It’s hard to get trough the shell but when you make friends with them you feel very comfortable and they tend to be friendships that last for a lifetime. He also told me that Finns don’t think much of themselves even though we are highly educated and fluent in many languages. Modesty is something we have learnt from our ancestors since we are a country that has risen from poverty to wealth in such a short time. The Irishman also admired the loyalty of Finns. He once lost his wallet in Finland and got it back few day later. He had over 200€ in cash in his wallet and once he got it back, everything was there. He told us to be more prouder of ourselves. And we should be. Once you get a Finnish friend, normally he/she or their family has a cabin by the lake and you are invited there. Finns do like holidays by the water. (may explain why Finns are such a good swimmers) Finns love sauna. Every household has one. The first time I lived abroad I was actually surprised that people don’t have saunas in their houses. Sauna is very traditional way to spend time with your friends in Finland. Summertime is great since it’s warm and you can smell birch branches in the sauna. We use those to whip yourself or your mate. It’s kinda relaxing. After the sauna you jump into a cool lake before running to sauna again to warm up. When winter comes nothing changes, you just have to make a hole in the ice. And birch branches are not recommended since they wont feel so soft without their leafs. And if you are lucky you can see northern lights in the sky. That is one of the most magical things to foreigners and for Finns too.